The Fresh Hot Sauce Blog: Sriracha Hot Chili Sauce -- or Why Hot Sauces Don't Necessarily Do to Food What You Think They Will! Sriracha Hot Chili Sauce -- or Why Hot Sauces Don't Necessarily Do to Food What You Think They Will! Sriracha Hot Chili Sauce from Huy Fong Foods, Inc. is a relative newcomer to widely available (a lot of mainstream grocery stores carry it), commercial hot sauces and has quite a number of fans, who think it wonderful on everything from eggs, to asian food, and from American Food to old boots, I guess. There isn't much neutral ground either: people like it or hate it. Why? It is a fairly simple sauce with only 5 major ingredients, quite thick, and with some real heat and a nice salty/sweet/sour garlicky flavor ... at first, but by itself, it has ... drum roll, please ... a rather bitter finish. Those ingredients are: red ripe jalapenos, sugar, salt, garlic, and distilled vinegar, along with some preservatives and xanthan gum thickener. I do not know where the bitterness comes from for sure, but I suspect it is from the jalapenos, which, even when full ripe and red, have a a grassy bitterness. If you taste HF Sriracha out of the squeeze bottle, that's the impression you are left with after the heat and other flavors fade -- mild bitterness. Not so nice. How many of us are looking for that in our hot sauces? Not too many, I think. Well, most people don't consume plain hot sauce; they add it to food. And that's where Sriracha shines, or, umm, should I say, tastes good. The mild bitterness which is really a fairly prominent, grassy herbiness adds complexity and depth to strong, simple flavors, and when Sriracha is mixed with other foods, that bitterness is diluted and muted and recedes into the background as a complementary and pleasant aspect to the overall flavor. But the first taste of Sriracha is really very nice indeed, with the bright, ripe pepper flavor and the lemony garlicky salty sweetness ... MMMMMmmmmm. Then of course, the bitterness. However, when diluted with food, the initial bright pepper flavor remains, and the bitterness fades quite a bit. Some more delicate foods do not benefit from Sriracha: I do not like it with the delicate flavors of eggs or fish, for instance. I also do not like HF Sriracha directly on many foods, such as over meats or on fries, but I do like it when mixed with other foods. But, Sriracha is great in making a Spicy Garlic Aioli, for instance. Just mix your favorite prepared mayonaise, I like Hellman's (Best Foods in the West) myself, with 1/4 to 1/2 the quantity by volume of Sriracha. Voila! Excellent Spicy Aioli! Great with fried foods, steak, sandwiches, you name it. 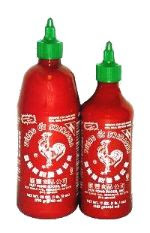 Let me say this though about Sriracha sauces: Huy Fong in the squeeze bottle is not the only brand around. There is also the much less widely available Shark Brand Sriracha which is a Thai product, note that Huy Fong is American, and, frankly, Shark Brand tastes better. Not as bitter and better balanced, but still with that nice salty/garlicky/acid bright flavor and not too much on the vinegar, and a little less heat. There is also an ABC Indonesian brand that I have not tried, and there are Ka-Me and Roland knock-offs of the Huy Fong product. Ka-Me I have not tried. The Roland product is even more bitter than the Huy Fong. Get the Shark Brand if you can. And the lesson here is that hot sauces don't necessarily taste the same right out of the bottle as they do in the food you eat. I can recommend the Shark Brand Sriracha without reservation, but the HF Sriracha I can only recommend with the fairly serious reservation that its real bitterness restricts its use to complex and robust foods. Hi Ted. First I had to grin at your sig... I too like to use the tilde with my name. We must be old school. But, I do love me the Sriracha sauces. The Huy Fong is quite pedestrian but thick and delicious. And it makes for a great wing sauce! The Shark Brand is a bit too thin for me. But it beats the crap they sell at Food Lion, etc. Sadly, our favorite Sriracha has been discontinued (Chuew Huad) according to Jerry at ImportFood.com (highly recommended for anything oriental). Just made a batch of fermented sriracha. Beautiful depth of flavor but had sharp bitter aftertaste. Was about to throw it all away when I read this. Tried mixing with mayo and the bitterness magically disappears leaving just the nice roasty chili flavor. Tried straight-up with cornbread and also chicken and you're right, the bitterness almost fades away. Appreciate your notes as I thought I'd failed but I hadn't at all.